This season we have had five weddings, that’s a lot of outfits to plan! For our most recent nuptials I was relieved to discover that (for A at-least) I need not worry, thanks to Angel’s Face. Just the week before I was contacted by their PR and offered the choice of any colour or style from their utterly divine collection of Tutu’s. 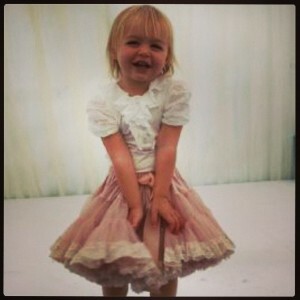 Could there be a more perfect outfit for a little girl at a wedding?! An Angel’s Face tutu is not just any tutu. They are infact the UK’s no.1 best selling pettitskirts and upon receiving ours, I chose a chic champagne and lace, I can see exactly why. Made from the softest, most silky, lace and tulle, with beautiful satin ribbon-tie detail, they are just exquisite. A wore hers with a cute ruffle-collar body from Italian brand European Culture. Her shoes were Papouelli which she wore with a pair of frilly white socks. 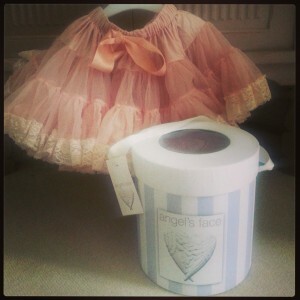 Angel’s Face cater for ages 0-12 + and their sizing is really generous. A’s skirt (in size 1-3) will definitely last for several years making it a real investment piece. Each style can be dressed up or down depending on the occasion. They look equally as good worn with a denim jacket and hunter boots as they do matching top and pretty ballerinas. I would also like to add, each skirt is presented in a stylish hat-box. For A this doubles up perfectly as a chic hold-all. She loves nothing better than to tote it around the house transporting all her favourite things! See the whole collection here. As well as petitskirts you can choose matching fru-fru tops, bodysuits and lace-trimmed leggings – On-top of a gorgeous collection of flowergirl dresses, accessories and shoes.